Turns out the Fourth of July holiday can be a dangerous one. 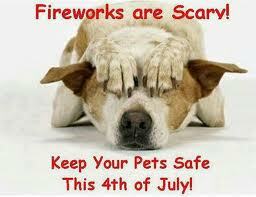 Before you head out to enjoy the barbecues and fireworks, consider the following. The Fourth of July is the most dangerous holiday for drivers, according to State Farm Mutual Automobile Insurance Company. The Hartford CourantÃ¢â‚¬â„¢s Insurance Capital blog reports that over the past five years an average 6,031 collision claims have been made by State Farm policyholders nationwide on July 4. By way of comparison,Ã‚ New YearÃ¢â‚¬â„¢s Day saw 5,403 collision claims and Memorial Day 5,321 claims over the same five-year period. Similarly, the Insurance Institute for Highway Safety (IIHS) reports that July 4 is one of the days with the highest number of crash fatalities. From 2004 to 2008 there were about 148 crash deaths each July 4, compared with 114 on a typical day. Check out I.I.I. facts and stats on highway safety for more information.